Very little is known about the role of long noncoding RNAs (lncRNAs) in epithelial ovarian cancer (EOC) development. Research in the Lawrenson Laboratory uses RNA-sequencing technologies to catalogue the lncRNA transcriptome of ovarian cancers and their precursor tissues: specifically ovar ian surface epithelial cells and fallopian tube secretory cells for the most common subtype (high-grade serous). 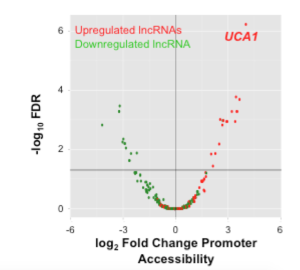 A current focus of the Lawrenson Lab is a specific lncRNA — UCA1 — that is associated with poor outcomes in EOC and we are using state-of-the-art antisense purification techniques to unravel the mechanistic role of this lncRNA in EOC cell biology. © 2019 Lawrenson Lab. Theme by Anders Norén.